Wear your favorite earrings, rings, necklaces, and more without skin irritation or discoloration. Simply spray jewelry with Alchemy and, once dried, you can't see it, feel it, or smell it. It’s working, though—like an invisible, barely-there barrier between jewelry and skin. Alchemy is a water-based, proprietary polymer blend that is easy to use: spray it on, let it dry, and your jewelry is ready to wear. Plus, it’s alcohol- and fragrance-free—meaning no harsh smell. And Alchemy actually protects jewelry as well, slowing the oxidation process, so it doesn’t tarnish as easily. Overall, Alchemy is a far better solution than putting clear nail polish on your baubles. As a jewelry Maker, founder Ashley Colonna was familiar with the problems metal can cause. She created Alchemy spray for people to enjoy their bling without worrying about it affecting their skin. With Alchemy spray, wear your jewelry with confidence and comfort. Hi Everyone! I am so excited to be here on The Grommet today to share Alchemy Spray. I came up with this unique solution to create a barrier between your skin and jewelry so that you can wear costume jewelry without experiencing discoloration and for those of us that have sensitive skin to even real jewelry. It is easy to apply, safe, and I hope you appreciate its benefits. I am here all day if you have any questions! Is this product safe on all base metals, such as nickel, brass, or copper? I have some lovely pieces that I wouldn't want to harm :) Thanks in advance! @April thanks for your interest in Alchemy! Yes, it is safe on everything. If you want to be extra careful, I would take a jewelry cleaning cloth and make sure any dirt and grime are gone because I have seen it react with that before. how long does it last? I am very sensitive to nickel. Hi Katherine, thanks for question. The spray lasts about 3-4 weeks. @Katherine An extra tip for my clients who are sensitive to metals, spray it, wait five minutes, and spray again. This gives you extra protection that is still invisible. A lady in my initial testing group is so allergic to metal that the grommets on her jeans burn her through her underwear. Alchemy is the only way she can wear jewelry and that's what she does just to be sure. that's me! I am really looking forward to trying this! At this point, I can wear surgical stainless steel (not much jewelry choice) or 14+k YELLOW gold - not white gold or even platinum! @Sharon One time my mom tried to (jokingly) convince a guy he could buy his girlfriend fake jewelry because he could use Alchemy and she would be none the wiser. He was interested...the girlfriend? For some reason, she didn't find it that funny. Ha! Looks like a valuable new product... but, what happens to gem stones? Does it dull them? Thank you! @Phyllis I have not had it dull anything yet! But, you can always wipe it off to be sure. My late husband sprayed my black diamond ring every night for 3 months after I went to bed to see if I would notice and I didn't notice a thing! Approximately how many applications a bottle? @Donna great question! I have been able to treat about 40 pairs of medium sized earrings per bottle. It depends on the size of the jewelry and how liberally you apply it. However, it was important to me for there to be a value to the size and I think you will be pleased with how far it will go! So super cool to see you on this site! I'm excited about this product because I'm queen of cheap jewelry and can't wait to see how it slows the tarnish down! My skin isn't sensitive or anything but I just like the pieces I buy and want to keep them around as long as possible! Thanks Ashley! @Kim Thanks so much! I am in the cheap jewelry club too and I got SO TIRED of using clear nail polish to treat my jewelry! It stinks, you can see it, you can smell it and it takes forever!! I invented Alchemy to have the protection for jewelry, without all that other crazy. I turn everything colors. Costume jewelry with gold...I turn the gold to an ugly brown. Will this stop that? Also, once it is brown, do you know of any way to get it gold again? @Sue I don't know of anything other than having something dipped, but that is typically more for fine jewelry. Maybe this should be my next invention! 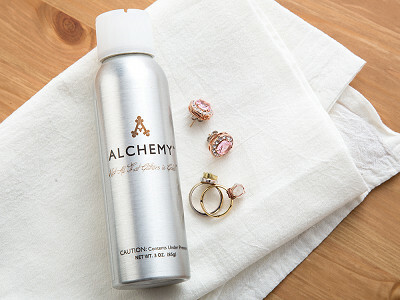 Alchemy will help keep your jewelry from tarnishing. Jewelry can tarnish for so many reasons and that is why Alchemy is so cool! Alchemy creates an invisible barrier on your jewelry that protects it from your skin or environmental factors that can break it down. But keep in mind, it is water based so it does have to be reapplied every so often to keep that protection going! @Loy I like the way you think! I need to get to work huh??? I wash my hands quite frequently. Do I need to remove any rings that I've sprayed, or ? @Sherry great question! It is always a good idea to remove jewelry before washing hands because that is just another step to keep it looking new and fresh. You don't necessarily have to remove them, but you would need to treat the rings more often because it can come off faster when soap and water is involved. I've developed such an allergy to precious metals that I've had to stop wearing my wedding rings that I've worn for over 40 years! I hope this is the answer. @Donna I think this is the part of Alchemy that has been so cool. I have customers who haven't been able to wear jewelry for years and this has been their answer. I hope this is the answer for you too! Does it wash off or deteriorate quickly? What kind of chemical will dissolve it? For example, if I use it on a ring will it wash off, or will it wash off in the laundry if it is used on the back of the button on my jeans? @Janice I would retreat my jeans every time. When I came up with the idea for Alchemy, the balance had to be between it being strong enough to work yet gentle enough to not irritate sensitive skin. On a ring it would take longer to wash off but I would still retreat more often if you aren't taking your rings off to wash your hands. I retreat my rings every 2 weeks or so just to be safe because I will itch and itch if I don't!! Hi! Curious if this would work as a buffer on a bracelet that pulls the fine hairs on my arm/wrist? @Catherine hhmm...I thought I had been asked every question about my product and I think you have stumped me! haha! My initial thought to your question would be no. It doesn't work like a clear coat where it is a visible hardened surface. I would say at $12 a bottle it wouldn't be an expensive option to try to be sure though! I'm very excited about the possibilities of this. A couple of questions: 1. I often react to the backs of earrings, where the backings are glued on. Will this affect the adherence of jewelry glue? 2. Will this affect the workings of watches? I will often react to the backs of watches where they touch my wrist, particularly after wearing for awhile and sweating, and would hate if this product damaged the workings or other innards of the watches I wear. 3. Will this affect fabrics? Or, which fabrics/plastics might this affect? Thanks! @Dayle I am excited that YOU are excited. Ok. Here are your answers: 1. It should not affect the glue. I have not had any reports of that happening or had it happen to my own earrings. 2. I spray my watch a bunch and have not had any kind of issue. I think most watches are more affected if they were submerged in water, etc. 3. I have only had a few people give me feedback on clothes. They have sprayed pajamas, jeans and a rain coat that the zipper had that harsh metal smell. No one has reported any kind of issue with the fabric. I would say it is always better to be safe than sorry. You might want to test a small area to be sure. @Ashley Thanks so much for the response. One more fabric/watch related question: Will the spray affect my leather watch bands? Or other leather objects? Thanks. @Dayle I have never sprayed it on leather! If you are just trying to spray the back of your watch, I would just place a paper towel over the leather band to be safe or just wipe off anything that was sprayed on there. I don't have any kind of leather bracelet or watch or I would go try it for you. Hhhmm...maybe I need to go shopping??? @Ashley You should definitely invest in a nice leather band...great for antique watches (I have a bunch)! One final question: Are there any precious or semi-precious or mineral stones that might be damaged with this spray? I'm thinking of onyx/jet beads or stones, opal, jasper, lapis, quartz, pearls, etc. Thanks again. Last one, I promise. @Dayle You ask as many questions as you want! I have not had any problem spraying any kind of stone, gem or jewel. If you are worried about that, you can always just spot dry it with a paper towel or tissue. I haven't received any feedback from anyone saying that it damaged any of the above either! @Ashley Thanks! Will be ordering. Does it work if earrings both your ears? I have not been able to wear them for years, I have tried clear nail polish and then I dip them in triple antibiotic and can only wear them for about 2 hours. @Judy I get so much feedback about how successful Alchemy is on earrings. You don't have to have a metal sensitivity for earrings to disturb that tissue. I have had customers who haven't been able to wear earrings for years and they can now with Alchemy! I have customer who can't wear earrings for more than a few hours at a time just like you and find that they can with Alchemy! Hi Ashley - My direct sales company is getting ready to add jewelry to their product line. There is concern about nickel and allergic reactions to metals. Is there a guarantee that the jewelry will not be (at the lack of a better term) ruined from this spray? I would like to be able to refer the product to our customers. Thank you. @Amy This product is very gentle. I have treated hundreds of pieces of jewelry and have never had a problem. However, I am also careful with my jewelry. (ex: I don't wear my jewelry while cleaning my house in case they come in to contact with any cleaners I might be using) I completely understand your concern about how it will affect your product line. I have had two complaints about it affecting jewelry and each time it was determined that the jewelry was treated with an oil or a chemical before applying Alchemy. I know that The Grommet has a return policy so I would refer you there in case your customers are looking for that kind of guarantee! @Ashley did I understand it can keep silver from tarnishing? For how long? I'm thinking of a necklace. @Susan great question! Yes it keep jewelry from tarnishing. It depends a bit on your environment and your pH but it is easy to retreat! I recommend retreating once a month or so if it is a piece you wear a lot. I had some jewelry designers in Mississippi test it outside on a carport for a month and the results were amazing at how well it protected the necklace! What a great concept! My main problem is the "harsh metal smell" that comes with many costume jewelry pieces. Does this spray eliminate that metal smell? Thanks! @Amy Yes! I have personally used it for this and have had lots of great feedback from customers who have used it for that exact reason! I have really enjoyed everyone's comments and questions! Keep them coming! Oh yeah, and buy some Alchemy! My question pertains specifically to sterling silver: it's not that my skin is sensitive to sterling, it's the other way around! I generally have to polish my sterling earrings every time I wear them, I long ago stopped wearing a necklace I used to love; rings are less of a problem if I wear them often. @PATRICIA YES! This will keep you from having to polish your jewelry as often. I would still give it a coating every month or so because it will wear off but it does not take a lot of time to treat your jewelry! Many people including myself are having allergic reactions to the Fitbit bands...do you think it would work for this problem? Do you have to continue to spray the item or once and your done? Hi Colleen, I'll let Ashley correct me if I'm wrong, but I think Alchemy would be a great solution to that problem. Like all jewelry, the spray will need to be reapplied every 3-4 weeks. Hope this helps! @Colleen I have never tested a Fitbit Band personally but depending on how much you sweat while wearing it or working out you might want to retreat a little bit more. The salt in our sweat can break down the formula a little faster. Maybe every 2 weeks or so! Let us know if it works for your FitBit problem! @Mike Thanks for all your help! Alchemy sounds like a solution for my gold allergy. But I have to make sure it doesn't have propylene glycol - it doesn't, right? Thank you! @Barbara no propylene-glycol that I know of! I'm allergic to nickel and often get a rash from clasps, etc. Will this alleviate the problem? @Dana i even get a rash from my glasses....the rim on my cheeks and the temple area...this will be wonderful and i will not be limited to clunky plastic.....thank you! @Dana Yes! It will alleviate the problem. My little pro tip would be to spray it, wait 5 minutes and spray again. That will give you a little extra protection from that sensitivity. I get great feedback from customers regarding protecting their skin from irritation!! @Lynnette I think this would be a great thing for your glasses! I would recommend spraying it on a paper towel and wiping it on where you need it. I'm working on manufacturing some Alchemy wipes for glasses so you are def on trend! Just wondering about how long it takes to dry? @Donna It depends on your environment. I live in Alabama where the humidity is pretty much always a factor and it takes around an hour or two to dry. Some people have been able to have things dry in a couple of minutes. I like to spray my jewelry before bed and let it dry overnight so I am not constantly checking it. Dear Ashley, I have extremely sensitive skin and get rashes from rings that have texture (e.g., raised gem settings, etc.) and rub against my skin and irritate it. Will your product help with this? Thanks very much! @Jennifer My initial thought to your question would be no. Alchemy won't change how your jewelry feels or looks. It will protect your skin from the irritation that metal itself can cause but not the actual texture. But if you think that some of your irritation is caused from a metal sensitivity, then that, Alchemy will help with. My daughter has sensitive ears and reacts to most earrings even 14K gold and surgical steel. Can she use this product on earrings?